Manissah James was born and died in 1881. His parents, Sylvester and Mary Ann Perkins James, were both members of the LDS Church when he was born; they lived in the Salt Lake 1st Ward.1 Manissah was blessed in that ward on 25 July 1881 by Joseph Warburton, making him “a child of record.”2 He died four months later on 11 November 1881, of pneumonia.3 The other James children who lived at least to the age of eight were baptized; presumably, Manissah would have likewise been baptized if he had survived. Church of Jesus Christ of Latter-day Saints. Record of Members Collection. Salt Lake 1st Ward. CR 375 8, box 2168, folder 1, image 59. Church History Library, Salt Lake City, Utah. Salt Lake City. Death Records, 1908-1949. Utah. Department of Health. Bureau of Vital Statistics. Utah Death Index, 1847-1966. Salt Lake City, Utah. United States. 1880 Census. Utah Territory, Salt Lake County, Salt Lake City, 1st Ward. 1 United States. 1880 Census. Utah, Salt Lake, Salt Lake City, 1st Ward. 2 Church of Jesus Christ of Latter-day Saints. Record of Members Collection. Salt Lake 1st Ward. CR 375 8, box 2168, folder 1, image 59. Church History Library, Salt Lake City, Utah. 3 Utah. Department of Health. Bureau of Vital Statistics. Utah Death Index, 1847-1966, page 122, no. 4300. 4 Manissah James, burial in City Cemetery, Salt Lake City, Utah. 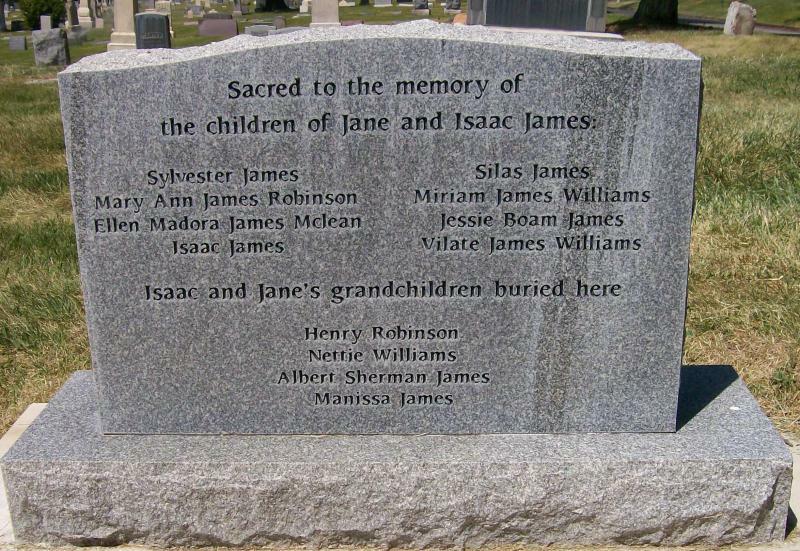 Entry in Find-a-Grave database.